Corning President James Clappin revealed in early 2015 that his company was developing a new cover glass material (codenamed Project Phire) that would offer scratch resistance on par with sapphire. Now, roughly a year and a half later, the glass composite is ready to go. 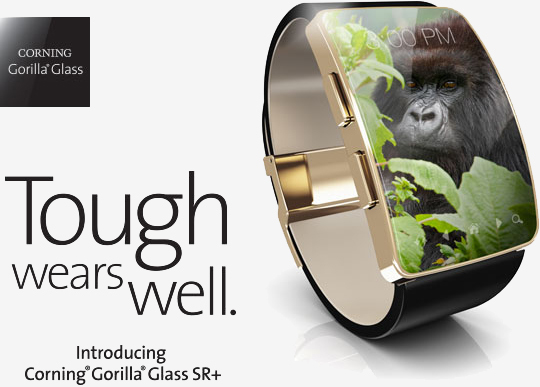 Gorilla Glass SR+ (the SR is for scratch-resistant), as it’s now called, was designed specifically for wearable devices. Corning said its scientists engineered the glass to better endure the bumps, knocks and scrapes that wearables often encounter while maintaining the optical clarity and touch sensitivity that on-the-go devices command. In lab testing, Corning said Gorilla Glass SR+ demonstrated scratch resistance approaching that of “alternative luxury cover materials” (presumably sapphire crystal) while delivering up to 70 percent better protection against impacts. It also offers 25 percent better surface reflection, an improvement that should result in longer battery life and improved outdoor readability. You may be asking yourself why Corning felt the need to create a brand new product specifically for wearables when many manufacturers have simply utilized traditional Gorilla Glass. The answer is that smartphones and wearables typically aren’t subjected to the same set of risks. For example, users are much more likely to drop a smartphone from waist height than they are a smartwatch which means shatter protection doesn't need to be as high. Conversely, a smartwatch is more prone to scratching and scuffing as it’s attached to your arm and exposed to the elements for much of the day. Corning’s new hardened glass is commercially available as of writing and should appear on products heading to market later this year.